Hello again, Dear Reader. I just thought I would post a quick review of a piece of kit I recently purchased since I've had a few days to play around with various settings and get to grips with functionality etc. Basically, a job came up where video footage is sought as evidence and, believe it or not, this really is the first time I've actually needed a video camera during surveillance. Which is a little embarrassing because I didn't have one. 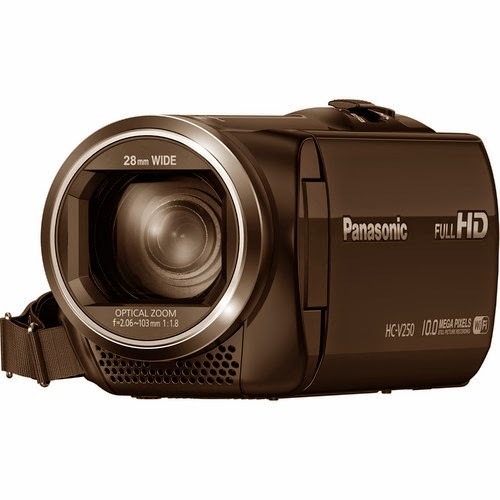 However, I did some quick internet research as to what was available at the usual large retailers and settled on the Panasonic HC-V250. It's slightly smaller than some others I looked at, measuring in at 116mm x 59mm x 53mm (that's 4 9/16" x 2 21/64" x 2 3/32" if you still use imperial). Weight, without battery or SD card, 216g (or 0.476 lb). There are several different recording modes depending on whether you favour quality or recording time (or battery life) and it takes SD, SDHC, or SDXC cards. Recording format is either AVCHD or MP4. USB charging. You can charge this while in your vehicle, even when in use, if you have a USB power adapter. No real need for second battery. No Date/Time stamping. Granted, it's a feature seemingly missing from many camcorders now but still annoying because it's an important feature to me. Plasticky build. It just doesn't feel right in my hand and I just know that it will be bad news if (read: when) I drop it. NFC. Yep, sounds like a quite nifty idea - teaming up your video cam with your smartphone. Except if you have a BlackBerry. Or anything other than Android or iOS. Overall, it seems to do most things required, and do them well. There are plenty of extra features that I don't need and will probably never use, so based on my own requirements I'll give this a solid B/B+. The lack of the date and time stamping really was the only major disappointment. And the reason I purchased this particuar model over the cheaper HC-V130 was the USB charging. Personally I find these things to be a matter of practice. I am a lousy photographer and a worse videographer. Without 20 minutes and a tripod its easy to become a panicky palsied producer of unfocused junk. Well it’s easy for me! Taking shots of birds in the garden, airplanes, neighbourhood happenings and the odd cricket match in the park over and over was the only way and I became halfway useful with a five year old vid cam. Then I borrowed a different newer and supposedly far better vid cam for a job. What a mess. As a side note; A good pocket cam for stills is a Nikon Coolpix SO1. Fits in a packet of smokes with space left. Idiot proof, decent zoom, good flash and no software to be loaded (you just plug it into the lap top). It will also take 30 min of decent video if mounted solidly. If you want high speed low light precision shots hire a professional is my opinion. But for all else the SO1 aint too bad. I have a similarish camera I use for day-to-day stuff, the Canon IXUS 510 HS and it's pretty damn handy as well as being palm-sized.